FEBRUARY 13, 2013 — Patrick Novecosky, editor of this blog and editor-in-chief of Legatus magazine, was a guest on KWKY Radio in Des Moines, Iowa, this morning. He appeared on the Catholic Radio Iowa Morning Show with Jeanne Wells and Dowling Catholic Hall of Famer Mark Amadeo. They interviewed Patrick about Pope Benedict XVI’s decision to step down effective Feb. 28. The conclave to elect the next Pope will begin in mid-March. 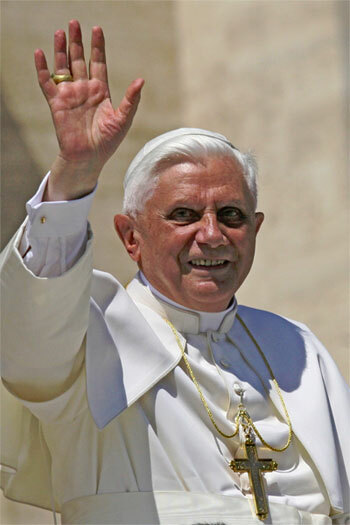 Novecosky reflected on Pope Benedict’s decision, his legacy and the future of the papacy. NOVEMBER 30, 2012 — Patrick Novecosky, editor of this blog, was a guest on KWKY Radio in Des Moines, Iowa, this morning. He appeared on the Catholic Radio Iowa Morning Show with Jon Leonetti and Jeanne Wells. Jon interviewed Patrick about Pope Benedict XVI’s recent teaching that parents should share the faith with children and others in a joyful, clear and simple manner. The Holy Father made the comments two days ago during his weekly general audience at the Vatican in the Pope Paul VI Audience Hall. Read more about the Pope’s advice on joyful parenting by clicking here. SEPTEMBER 21, 2010 — Despite the fact that secularism has nearly overrun the United Kingdom over the past few decades, the celebration that surrounded Pope Benedict XVI’s historic visit last week was a breath of fresh air. Nearly 100,000 strong gathered to welcome him to Scotland when he landed there on Sept. 16. The visit made history on several fronts. It was the first ever state visit to the UK by a pope. Former British Prime Minister Gordon Brown invited the Holy Father in February 2009. Pope John Paul II’s 1982 trip to the UK, by contrast, was a pastoral visit. 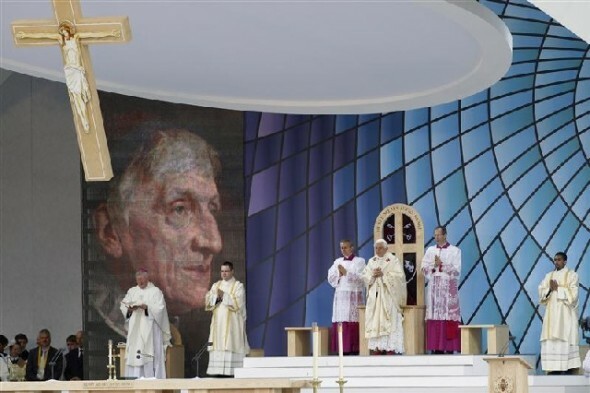 On the last day of Benedict’s four-day trip, he beatified Cardinal John Henry Newman, the preeminent Catholic convert of the 19th century. Newman is the first non-martyred Englishman to advance toward canonization since King Henry VIII sat on the throne. It was also the first beatification Pope Benedict has presided over. Although these “firsts” are significant, perhaps even more significant is the thawing of anti-Catholic sentiment that began to brew in the weeks leading up to the visit. A few prominent atheists called for the Pope’s arrest earlier this year due to the sexual abuse scandal, various secular pundits took swipes in the media at Catholics, and on the second day of the visit, five men were arrested for concocting a terrorist plot against the Pope. Another was arrested the following day. No doubt the prayers of the faithful were instrumental in disrupting the plot. In the most delicate political address of his trip, the Holy Father addressed 1,800 British politicians, business leaders and intellectuals at Westminster Hall, the very spot where St. Thomas More was condemned to death in 1535 for refusing to accept Henry’s Act of Supremacy over the Church of England. “If the moral principles underpinning the democratic process are themselves determined by nothing more solid than social consensus,” the Pope said, “then the fragility of the process becomes all too evident. Herein lies the real challenge for democracy.” Among those attending were former prime ministers Margaret Thatcher, John Major, Tony Blair and Gordon Brown. 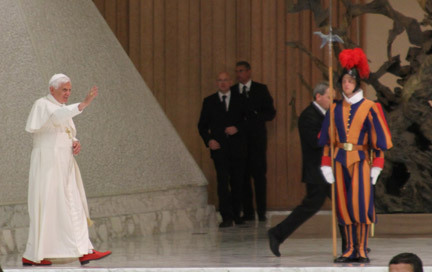 The Pope greeted each one personally before leaving the hall amid great applause. It remains to be seen whether or not the new Blessed’s intercession will result in a revival, but one thing is sure: The UK will forever be a little brighter after seeing the successor of Peter. Patrick Novecosky is the founder and editor of The Praetorium. 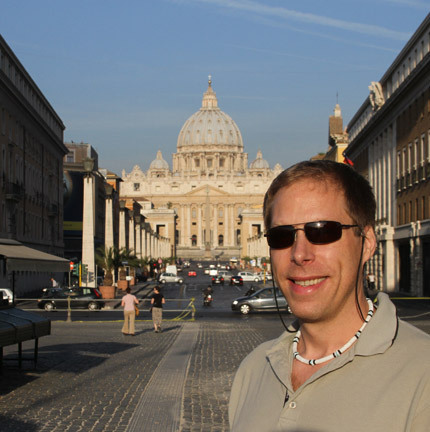 SEPTEMBER 14, 2010 — I’ve been a Catholic journalist for more than 18 years. I’ve worked for an archdiocese, a weekly Catholic newspaper, a Catholic university, a religious order, and a few Catholic magazines—not to mention freelancing for a potpourri of national Catholic publications. So I sometimes feel like I’ve seen it all and heard it all. 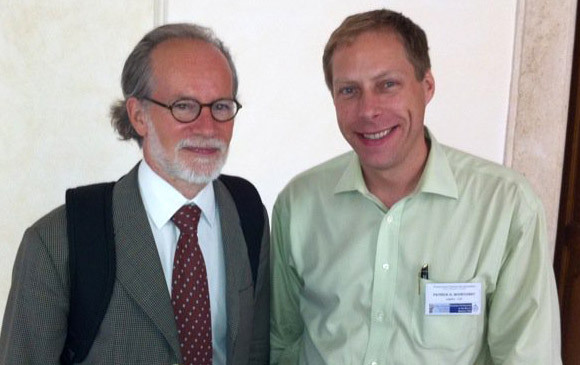 Then I came to Rome for a conference for journalists who cover the Catholic Church. The truth is, I’ve just scraped the surface. The universal Church is as diverse as its 1.1 billion adherents, yet we are one body in Christ. This is my second post from Rome. I’ve just wrapped up a seminar—The Church Up Close: Covering Catholicism in the Age of Benedict XVI—at the Pontifical University of the Holy Cross (Santa Croce). Attending the seminar, organized by the university’s School of Church Communications, were 27 journalists from eight nations. Many of our speakers in the last half of the seminar asked that we keep their comments off the record, so this post doesn’t reflect the full scope of what we experienced, but it reflects the tenor of the class. Our speakers discussed everything from economic justice and the Church in Africa to Pope Pius XII and how the Church communicates in the digital age. Although I don’t expect to report on all of these issues any time soon, the speakers have helped build my base of knowledge on a huge variety of topic areas. The seminar’s fourth day kicked off with a subject I have reported on extensively—stem cell research. 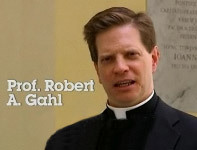 Father Bob Gahl, a Santa Croce professor, discussed what the Church really teaches about stem cells. Contrary to what the mainstream media preaches, the Church is not against science. It is not against progress, and it is not against stem cell research. The Church has always maintained that human life must be protected at every stage—from conception to natural death. It just so happens that one form of stem cell research destroys human life. 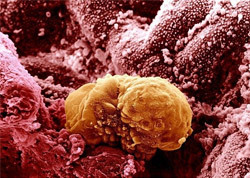 Embryonic stem cell research (ESCR) requires the destruction of a human embryo. As a former embryo myself, I fully concur with the Church’s position. There’s one aspect of such research that the Church hasn’t conclusively addressed. There are about 400,000 frozen embryos living in suspended animation. Some Catholics favor embryo adoption where these embryos would be implanted in a woman’s uterus (with her consent) in order that they may be brought to term. The others options are few: the frozen embryos will be destroyed in research or they will be allowed to die a natural death. The former is immoral. The latter is not. The debate is whether it’s moral to implant an embryo (that is already created) which will either die in research or, once its “shelf life” is over, it dies a natural death. Our presenter, Fr. Gahl, said he doesn’t expect the Vatican to make a pronouncement for at least 10 years. The last Church document on stem cell research was Dignitas Personae (The Dignity of a Person), issued in 2008 by the Congregation for the Doctrine of the Faith. Although the CDF hasn’t hinted that it will issue a new bioethics document any time soon, many expect one in the next few years. We don’t expect embryo adoption to be included in the document. Ultimately, Fr. Gahl said, the Church teaching on ESCR is based on the Biblical truth that human beings are created in the image and likeness of God and that Jesus Christ became flesh in his mother’s womb. Jesus, too, was once an embryo like all the rest of us. Science, Fr. Gahl said, has determined that within seconds of a sperm cell penetrating an egg, the cell “begins to act differently”—meaning that it is no longer two separate cells, but new creation, a human life. I often use the analogy that once a seed planted in the ground begins to sprout, it is alive. So too with a fertilized human egg. Our Thursday afternoon session delved into the Catholic Church in Africa. What I expected to be a snoozer turned out to be one of the most interesting sessions of the entire seminar. Monsignor Fortunatus Nwachukwu, head of protocol at the Vatican’s Secretariat of State, delighted the entire group. The priest, who hails from Nigeria, began by discussing Vatican protocol, the ins and outs of the Holy Father’s foreign visits and his security, and the importance and reasons for the Holy See’s diplomatic outreach. The most fascinating aspect of his talk, however, centered on the African church. While the Church in Africa is celebrating a century since the last major wave of Catholic evangelization, the continent has biblical roots. Moses had an Ethiopian wife. Jesus went to Egypt as a child. Simon of Cyrene was African, from modern-day Libya in Northern Africa. After the first-century destruction of Jerusalem (70 AD), many Christians moved to Africa. The Church declined until a wave of Portuguese evangelization around 1600, Monsignor Nwachukwu said. The slave trade, however, decimated the Christian population in Africa. Today, the Church in Africa is alive and vibrant, sending missionary priests to the United States, Canada and Western Europe. Monsignor Nwachukwu noted that just as Arabic is a language that binds Islam together in prayer, Catholics must not forget that Latin has the same binding together effect for Catholics. He ended his talk by stressing that the Church cannot be allowed to fail in promoting reconciliation, justice and peace in every nation of the continent. This articulate 50-year-old priest will be one to watch as he rises through the ranks of the Vatican curia. The Holy Father is scheduled to visit Glasgow, London and Birmingham from Sept. 16-19. He will meet Queen Elizabeth II and PM David Cameron. And he will beatify Cardinal John Henry Newman, the most distinguished Catholic convert of the 19th century. We had the distinct pleasure of hearing from Jack Valero, official spokesman for Newman’s beatification, on Thursday evening—a little more than a week before the actual event. This will be the first official state visit of a Roman pontiff to the United Kingdom in history. Technically, John Paul II’s 1982 trip to the UK was considered a pastoral visit. Pope Benedict was invited by then-Prime Minister Gordon Brown in early 2009. Despite the incredibly secular culture in England, the state has been exceptionally accommodating for the papal visit, Valero said. The economic spin off from pilgrim spending will surely result in the state turning a profit. Another interesting tidbit Valero dropped was that Newman will be the first non-martyr Englishman to advance toward canonization in more than 400 years. Newman’s greatness, he said, was that he was willing to follow the truth wherever it led him. Valero, himself, has made a big splash in the UK in the months leading up to the papal visit. He co-founded Catholic Voices, a team of 20 Catholic speakers able to articulate with conviction the Church’s positions on major contentious issues in the media. Since its launch in February 2010, the project has been reported in various magazines and newspapers. Its speakers have appeared in numerous public debates. They are professionally trained (thanks to Valero and his staff) to unflinchingly present the truths of the faith in a highly secularized culture. I told Valero that he should pursue a companion program for priests, bishops and seminarians. God willing, the tide will turn in the UK with folks like Valero leading the way after the papal visit! We were treated to a delightful lecture from the first Israeli-born priest in centuries when Fr. David Jaeger, OFM, spoke to us about the controversy over Pope Pius XII and the Jews. I’ve written about this subject a time or two, so Fr. Jaeger’s talk was informative and delightful. He’s a man who doesn’t need a microphone and has no problem holding his entire audience in the palm of his hand. Among the facts that seem lost commentators on this subject: Eugenio Zolli, the chief rabbi of Rome converted to Catholicism after World War II ended because of Pope Pius XII’s commitment to saving Jews during the war. Jewish leaders (and everyone in the know) considered Pius a “righteous Jew” until 1965 when a historically inaccurate play called The Deputy was published. The play alleged that the pope did little or nothing to help Jews during the war. Eventually books like Hitler’s Pope followed, exacerbating the invented controversy. Then in 2005, the Yad Vashem holocaust museum in Jerusalem put up a plaque dissing Pope Pius. Sadly, the controversy has cast a cloud over the Pius’ cause for canonization. 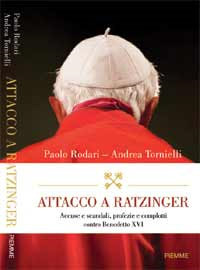 Our final day in the classroom wrapped up on Saturday with an enthralling presentation by Andrea Tornielli and Paolo Rodari, authors of the newly released Italian-language book Attacco a Ratzinger: Accuse e scandali, profezie e complotti (Attack on Ratzinger: Accusations and Scandals, Prophecies and Plots). 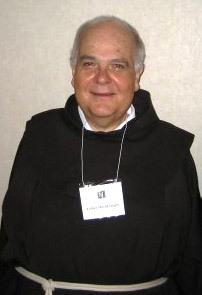 Tornielli, one of the most respected Italian Vaticanisti, talked about attacks on the Pope that come from two distinct groups—from liberal progressives outside the Church that object to Catholic teaching on a wide range of subjects, and from those inside the Church who object to the Holy Father’s governance of the Church—including bishops who disagree with things like the Benedict’s motu proprio, the apostolic letter Summorum Pontificum announcing greater use of the Tridentine Mass, and his lifting of Bishop Richard Williamson’s excommunication despite the bishop’s denial of the full extent of the holocaust. The Italian journalist, author and blogger argued that most Vatican critics have their mind made up about Benedict. They have a “frame” about him, and won’t accept anything that doesn’t fit in that frame. Tornielli told us that the Roman curia structure hasn’t changed since Pope Paul VI’s 1967 reforms. All papal communication flows through the Secretariat of State, and the Holy Father doesn’t get information directly from the world’s bishops’ conferences or various dicasteries. The Vatican has, however, hired a Swedish company to monitor information about the Holy See on the internet, Tornielli said. 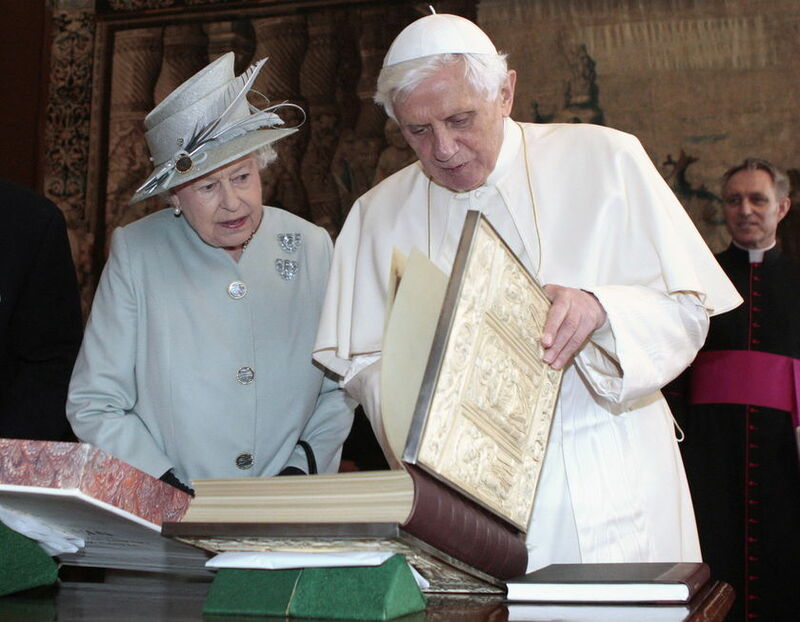 Both authors agreed that Pope Benedict is a very good communicator who addresses issues squarely. However, they also agreed that the Vatican really needs a communications strategy. It was clear from hearing from Tornielli, Fr. Federico Lombardi (director of the Holy See’s press office) and John Thavis (Rome bureau chief of Catholic News Service) that there’s tremendous lack of communication among the Vatican’s various departments, dicasteries, pontifical councils and the Pope’s personal staff. While it’s counterintuitive, Thavis told us earlier in the week that the disconnect in the Vatican works well. Tornielli was more ambivalent. There’s so much more I could write about the seminar, but suffice it to say that Santa Croce’s School of Church Communications truly out did itself. This was its second seminar for journalists, and the next one is two years away. I expect it will fill up quickly. 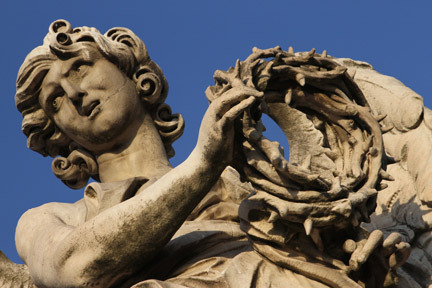 SEPTEMBER 9, 2010 — Blogging from Rome isn’t easy. It’s like asking a child who rarely goes out to play to come in from the playground. To make that analogy complete … there’s no school bell. Rome is a Catholic playground in the sense that it’s one of the best places in the world to learn about and become immersed in our faith. After landing in Rome on Sunday morning, I had two objectives: To find a Sunday Mass and to get some sleep. Both were easy to find. I took the Metro (train) from the airport to the Termini (main terminal downtown), then caught a short cab ride to my hotel. The guy behind the desk said my room wasn’t ready and he didn’t have a list of Mass times. I only had to wait 20 minutes before my room was ready, so I checked in then walked a block to the nearest church. If you’ve never been to Rome, you have to realize that churches are so close together in the main part of the city that you rarely have to walk more than two blocks to find one. Not only that, but most are huge, old and beautiful. Sadly, they are also under-used. The seminar I’m here for — The Church Up Close: Covering Catholicism in the Age of Benedict XVI — is being held at the Pontifical University of the Holy Cross (aka Santa Croce) — one of several pontifical universities and one of the newest. The course has attracted 27 journalists from eight countries. I initially expected the seminar would draw secular journalists who were eager to learn more about the Church and how it operates. However, most of the folks I’ve met here so far are pretty well-versed in Church teaching and its position on most issues. What I’m finding, however, is that we’re here for a deepening in our understanding on how the Church operates and its position everything from stem cell research, the sexual abuse crisis, poverty, and how the Holy See communicates with the world. Our first day, Monday, was a full day in the classroom. We were treated to a session on the nature and mission of the Catholic Church. Father Paul O’Callaghan, a Santa Croce professor, gave us a quick snapshot of the Church’s origin in the Jewish people through to Jesus Christ, the apostles and their successors. 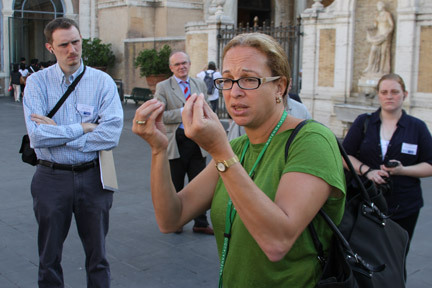 Later in the day, two “Vaticanisti” treated us to a few hours of what it’s like to be a full-time Vatican reporter. 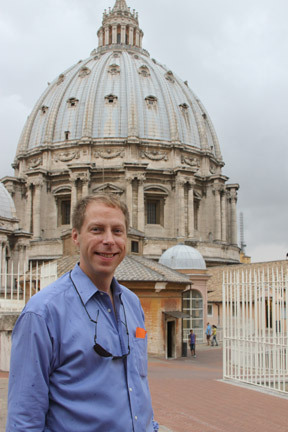 Catholic News Service Rome Bureau Chief John Thavis, whom I’ve met several times before, and Trish Thomas of the Associated Press TV, relished us with dozens of stories from their experiences with both Pope John Paul II and Pope Benedict. Both agreed that the most memorable and rewarding experiences came during papal trips overseas — in particular traveling on the papal plane. 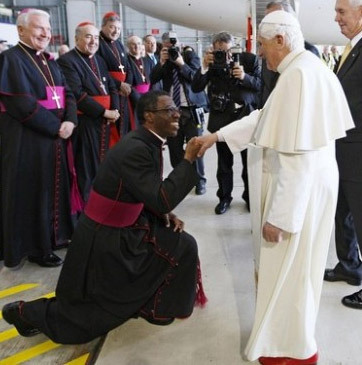 Thavis talked about his first attempts to get interviews with Vatican cardinals. He quickly learned that “ambush interviews” don’t work, meaning that waiting to catch a cardinal or other church officially without making an appointment or putting in a request, just doesn’t fly. His point was that the learning curve for most Vaticanisti is rather long. One of the more fascinating differences between Benedict and John Paul is the way they interact with journalists on the plane. Normally, 40-60 journalists travel on the pope’s plane when he travels abroad. John Paul occasionally waded into the crowd of journalists at the back of the plane. He sometimes sat and bantered with them for an extended period of time. Thavis said later journalists would share their taped interviews with the pope, which made for compelling stories. Pope Benedict, on the other hand, is more comfortable taking pre-submitted questions. Both Thavis and Thomas agreed that the pope isn’t afraid to choose from the tougher, more controversial questions. The answered a question about condom use on a trip to Africa several years ago. Both seemed to expect the pope’s upcoming trip to the UK will be a great success despite some of the controversies swirling about. I began this post talking about Rome as a playground for Catholics. Tuesday kicked off by a morning tour of the Vatican museums and the Sistine Chapel. Liz Lev, art historian and one of the best tour guides in the Eternal City, led us through three-hour blitz through the museums, capped by a fascinating visit to the Sistine Chapel. It was my third visit to the museums, but certainly the most in-depth experience. After a short break, we crossed the street to the road leading directly into St. Peter’s Square — Via Conciliazione — to the Holy See’s Press office. Papal spokesman Fr. 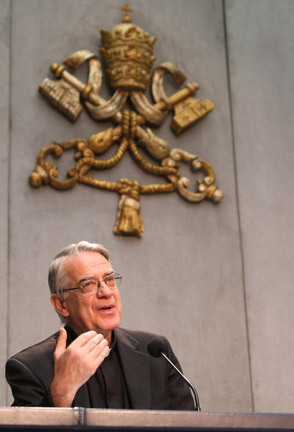 Federico Lombardi, SJ, spent a full hour with us. He began by explaining the history and role of the Press Office. He talked about his work, his challenges, and how he interacts with the 400 journalists (Vaticanisti) accredited to the Holy See. One of the challenges the Press Office is the challenge of explaining the more complex Church documents and positions to journalists. Lombardi also stressed that it’s essential for the Church to be transparent in the more difficult questions posed to the Church, in particular the sexual abuse of minors. The Holy Father will visit Glasgow, London and Birmingham next week. Father Lombardi said they feel no “trepidation” about the trip despite some popular atheists and groups calling for officials to arrest the pope. He said polls in the UK are mostly positive regarding the visit, and that the Pope will explain what the Church has to offer the people of England and Scotland. Our evening session took place at the offices of the Congregation for the Doctrine of the Faith. American priest Monsignor Charles Brown, a staff member at the CDF, gave us a fascinating overview of the office’s history, its link to the Inquisition and its relationship to Pope Benedict, who was the prefect of the CDF before becoming pope. We were giving an all-access pass to the Roman playground on Wednesday. Our seminar group had tickets to the papal audience before a full afternoon of free time to tour the Vatican. Prior to the pope’s audience, I had the honor to spend 30 minutes with Cardinal John Foley, the grandmaster for the Knights of the Holy Sepulchre. 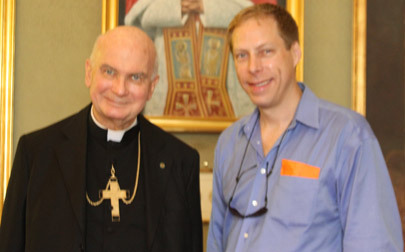 I first met the cardinal in 2006 when he was the president of the Pontifical Council for Social Communications. We last met again last year in Jordan immediately after the papal Mass in Amman, Jordan. Certainly one of the warmest prelates I’ve ever had the pleasure to meet, Cardinal Foley always remembered my name despite the years between our meetings. I have attended at least two Wednesday public audiences at the Vatican during the time of John Paul II. The audience we attended was held in the Paul VI Hall, inside the walls of Vatican City. Completed in 1971, the hall holds 6,300 people. I found a seat in the front third of the hall. The Holy Father was wildly greeted as he entered the packed hall around 10:30 am, and even more so when he mentioned the various pilgrimage groups over the course of his talk, which he delivered in at least six languages: English, Italian, French, Spanish, Polish and German. Interestingly, our group was the first one he greeted when he spoke in English. Yay! Yeah, I cheered. One of the best parts of papal audiences, generally attended by pilgrims to Rome from around the world, is the reaction of these groups when mentioned by the Holy Father or the priest announcing their presence. Polish seminarians broke into song, Mexican pilgrims waved banners and flags, and American parish groups cheered and stood on their chairs. Every time I attend one of these audiences, I’m reassured that the Church is alive, vibrant and truly catholic, that is, universal. After a quick lunch in St. Peter’s Square, our group was split in two, for a guided tour of the “scavi,” the excavation site under St. Peter’s Basilica. 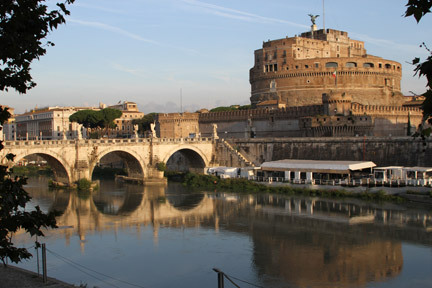 In the 1930s, the Vatican commissioned archeologists to excavate the site in order to explore the remains of the original basilica, built in the fourth century, and the existence of St. Peter’s remains. Today’s basilica is right beside what was once known as Nero’s Circus where St. Peter was crucified upside down for teaching the faith. His remains were buried a stone’s throw away in a nearby burial site, apparently between two brick walls in a pagan grave yard. When Constantine converted to Christianity in the fourth century, he decided to build a basilica on Peter’s tomb. I often marvel at the political capital he must have expended in building a church over a grave yard where some very wealthy Romans had buried their ancestors. The hot, damp tunnels under the basilica led us to the pagan mausoleums, which were very well preserved. Buried in the fourth century to make way for the basilica, mosaics, paintings, urns and sarcophagi appeared much as they did 1500 years ago. One story above the tombs, were some remnants of Constantine’s basilica. Finally, the last stop of the scavi tour brought us to a room where we could see, behind glass and inside one of the original altars of the first basilica, an ancient box that holds St. Peter’s relics. I paused to remember my family, friends and their special intentions in a quick prayer to the first pope. It was my third scavi tour. It never gets old … and not just because it is old (ha ha), but because it’s one of the most profound and tangible aspects of Christian faith. The man who walked on water, who spent three years with Jesus Christ, the man who denied him three times, and the man who was given the Keys to the Kingdom was right here with me. Our faith is tangible, it is historic and it is real. After viewing the tombs of the popes — including that of Pope John Paul II — below the basilica’s main floor, a few of us found our way from the scavi tour under the basilica to the cupola, nearly 450 feet (135 m) above the square below. We stood in the queue for about 20 minutes before dropping 7 euro to take the elevator to the basilica’s rooftop. From there, it was 320 windy, narrow stairs to the cupola. This was my third time on top of the famous basilica. It was windy, threatening to rain, but incredibly still crowded. The view of Vatican City and all of Rome is unbelievable. We tried to visit the basilica’s adoration chapel after bringing ourselves to ground level. The priest had just begun benediction, so we were turned away by the guard at the door. No matter, we wandered about and found the glass coffins of a 17th century pope and that of Pope John XXIII, who died in 1963. 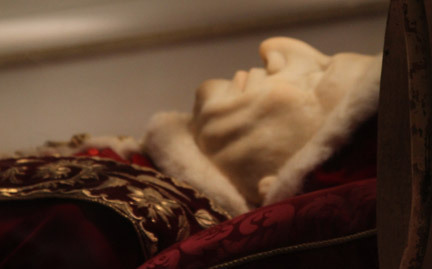 About 10 years ago, his exhumed body was found to be partially in corrupt and placed in the upper floor of the basilica. His face is covered with a thin protective layer of wax. We had to hurry back to the university, a 30 minute walk from the Vatican, for a fascinating session on canonical trials in the church by Monsignor Charles Scicluna, who works at the Congregation for the Doctrine of the Faith. I don’t know if all of my readers find Rome — and this kind of in-depth exploration of the Catholic Church — as captivating as I do. I expect that if you’re reading this final paragraph, you do too! In the coming days, we’ll learn more about the Church’s position on stem cell research, the Pope’s upcoming trip to the UK next week, the Vatican’s use of new technology, and we’ll wrap up on Sunday with a trip to Subiaco, the site of St. Benedict’s final monastery. I fully expect it will be as fascinating as what I’ve already experienced in my Roman playground. Stay tuned for my next blog post! MAY 18, 2009 — Pope Benedict XVI stepped into the fray of Middle East politics by endorsing a Palestinian state during his recent pilgrimage to the Holy Land. During his May 15 farewell speech at the Tel Aviv airport, the Pope stressed the need for universal recognition of Israel’s right to exist and the Palestinians’ “right to a sovereign independent homeland. “Let the two-state solution become a reality,” the Holy Father said, noting that six decades of bloodshed in the Holy Land has distressed him. The impassioned speech was one of the many highlights of Pope Benedict’s May 8-15 pilgrimage to the Holy Land, which began with a four-day stop in Jordan. In many ways, his visit mirrored that of Pope John Paul II, who visited Jordan and Israel in 2000. Pope Benedict began his journey with a stop at Jordan’s Mount Nebo, where tradition says Moses gazed out upon the Promised Land before his death. The Pope visited a mosque in the Jordanian capital of Amman before participating in vespers at St. George Melkite Cathedral. It was inspiring to see the Jordanian Christians’ affection for the Holy Father. They shouted, waved flags and sang when he entered the cathedral. The applause was almost deafening. More than 30% of Jordan’s 109,000 Catholics piled into Amman International Stadium on May 10 for the papal Mass. The youth presence was impressive. Thousands of young people cheered and sang long before the Holy Father’s arrival. A song written especially for the papal visit — “Benvenuto Benedetto in Jordania” (Welcome to Jordan, Benedict in Italian) — rang through the crowd dozens of times throughout the morning. In his homily, the Pope exhorted the Middle Eastern Christians to stay in the Holy Land and give testimony to Jesus in this conflict-plagued region. In his farewell address in Amman on May 11, the Holy Father hailed Jordan as a model for peace and religious tolerance in the Middle East. “I would like to encourage all Jordanians, whether Christian or Muslim, to build on the firm foundations of religious tolerance that enable the members of different communities to live together in peace and mutual respect,” he said. The Holy Father wasted no time getting down to business after touching down in Israel. He called for a Palestinian state in his first speech. He went on to meet with other religious leaders, visit the Church of the Nativity in Bethlehem and the Church of the Holy Sepulchre in Jerusalem, and celebrate Mass in Nazareth for about 50,000 pilgrims. Together with Israeli president Shimon Peres, the Pope planted an olive tree at the presidential palace as a sign of the close relationship between Jews and Christians. He called this gesture, along with meeting with Holocaust survivors at the Yad Vashem memorial, the most memorable of his pilgrimage to Israel. Patrick Novecosky is the editor of Legatus Magazine and the founder of The Praetorium. This article was published in the June 2009 issue of Legatus Magazine. He was in Jordan for Pope Benedict’s four-day visit to that country.